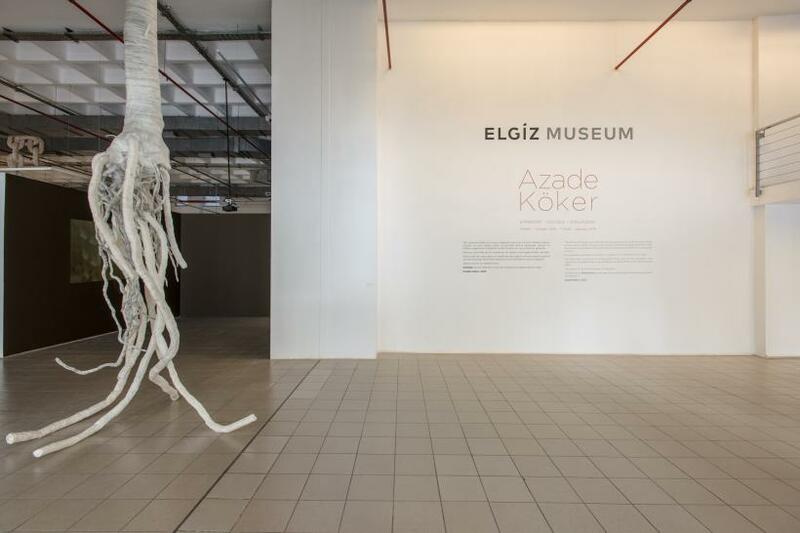 Azade Köker has spent most of her personal and professional life between two sprawling metropolises: Istanbul and Berlin. No doubt that they are two very different places in terms of architecture, demographics and history, yet both exude a strong identity and energy. The remnants of wounded pasts, as well as challenging futures, are writ in their urban fabric. It is no coincidence then that the urban environment, and memory, history and narrative play such an important role in Köker’s oeuvre. 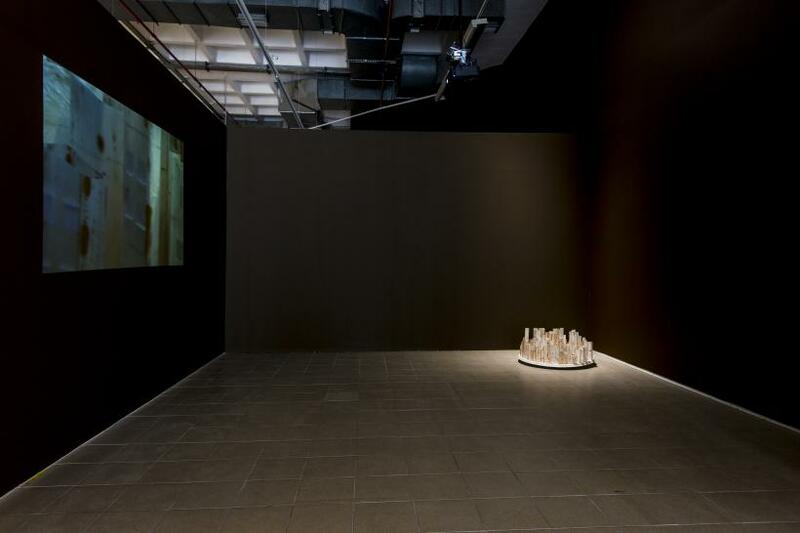 She infuses her works with anthropomorphic qualities making these cities, and the objects therein, seem at times like rapacious monsters, at times like caring mothers. Her practice is punctured by the uneasy tensions between construction and decay, order and disorder, the ephemeral and the eternal. 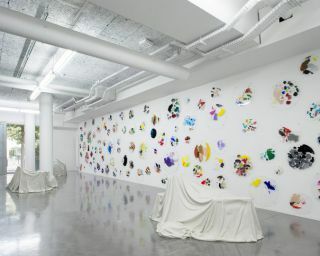 These are, however, not opposing forces but rather muddled and layered concepts that battle each other on her meticulously constructed visual planes and installations. Her take on cities like Aleppo, Beirut, Bodrum, and Mardin are a case in point. She constructs alternative cartographies, mapping out these cities’ vistas through the many photographs she has taken on her travels, rearranging their placement and coordinates vis-à-vis the geographical map. All these photographic snippets make up a composed cityscape, but feel somewhat out of place. With Köker, immediate representation is often broken. We rarely view a pristine, whole image that discloses all its information. 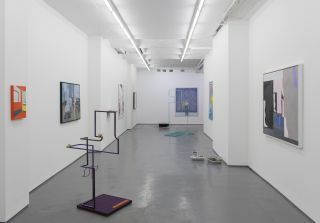 To the contrary, Köker’s imagery is layered, partial, edited, and highly subjective. 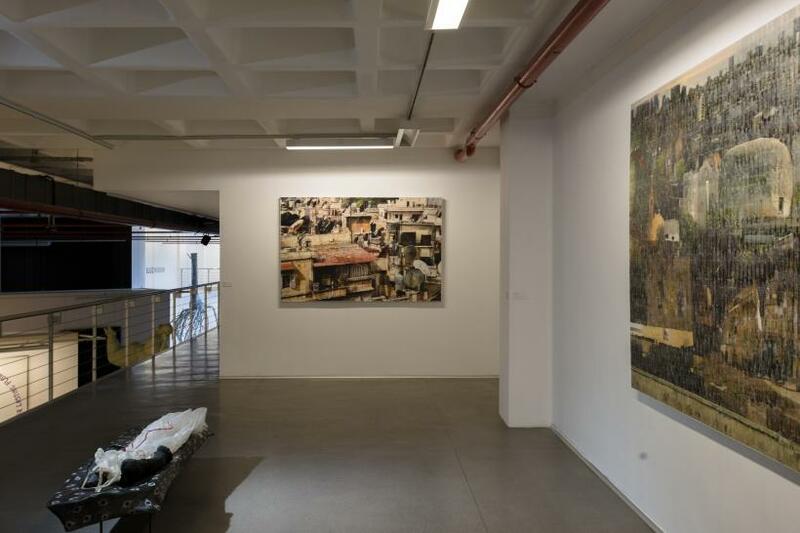 For example in the large-scale mixed media work Beirut (2014) the artist collages hundreds of photos taken on a trip to the Lebanese capital. A sectarian and divided city, also after the end of the civil war in 1990, Köker’s Beirut feels even more chaotic and fragmented than the actual city. Some landmarks, like the Egg, a pre-war cinema controversially destined for demolition in downtown Beirut, are blown out of proportion and feature prominently. A church adorns the Western part of her map, while a mosque the Eastern part. 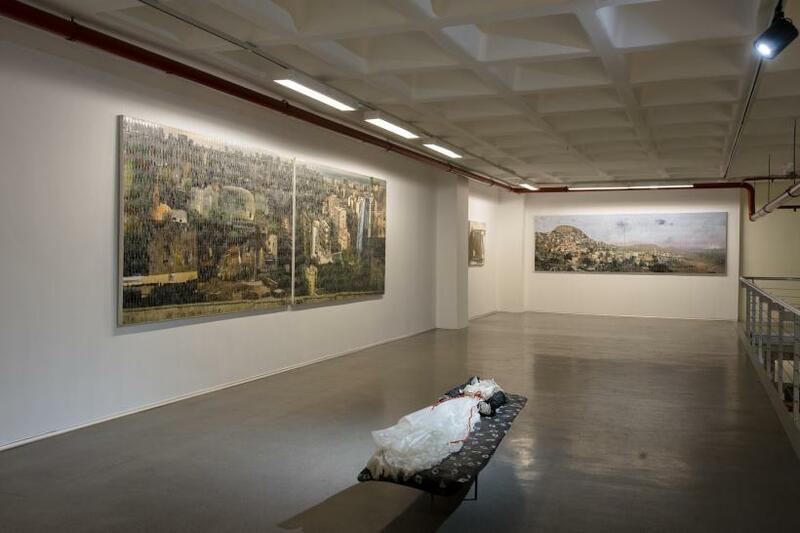 The artist has flipped the sectarian divide of a city in which the East is predominantly Christian and the West Muslim. Construction cranes are a common sight in the city, yet here they function as a marker of destruction. Indeed, with every new high rise an old traditional house is knocked to the ground. Moreover, this work seems to suggest that the built environment is all there is. There is hardly a strip of sea or sky left. The buildings have gobbled up all available space. 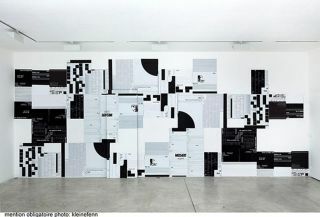 Köker’s signature technique of superimposing her images with photographic cut-outs creates texture and three-dimensionality. In this case she has combined the contours of human figures, covered with a layer of translucent paper, with cut-outs of fighter jet planes. The city’s population has turned into ghosts, perhaps a reference to the many that disappeared during the civil war and have not been accounted for, or to the paralysis of a dysfunctional state. In addition, the threat of war is looming. Köker’s is a brutal postcard but also a truthful one. Hers is not a snapshot of a non-existent utopia for holidaymakers, but rather the messy underbelly of reality. In a volatile region where facts on the ground are changing on an almost daily basis, Köker also performs the work of memory, preserving images that in a few years might all but be wiped from the map. In a new body of work for the exhibition at Elgiz Museum, the volatility between disappearance and remembrance is emphasised even more. Her paper sculpture Abandoned City (2015) recalls shrinking cities like Detroit, ghost cities like Pripyat next to Chernobyl, or the desolate and unfinished town of Mush in Armenia, near to completion before funds ran out in 1989. Abandoned City is a miniature city, all in all only 90cm in diameter and 40cm high, yet boasting an impressive skyline. Here again is that ghostly white translucent paper, a throwaway material, nothing like the sturdiness of bricks and mortar. Köker uses sheets of paper that she wraps around a corroded iron construction profiles. The iron profile gives the paper its tube-like perpendicular shape but its rust also leaves a trace on the paper. Then she fashions - rust-side inwards - small, simple open-roof high-rises that populate her urban scenery. It is perhaps a little ironic that such an easily discarded material as paper must become the building blocks for a whole city. A city that despite its fragility and impermanence becomes monumental, though imperfectly so. Rust is per definition a substance that alludes to the passing of time and loss of function. It is the rub between the residue of a corroded material that has lost its original function as a construction material and ever-recyclable paper that produces the uneasy poetry of this piece. The scenery seems frozen in time, but it also engages different temporalities. It is therefore a reluctant ruin, one that straddles between its past and present form, uncompleted, hollow, as its lack of roof suggests. The artist has installed the small city on that other ugly urban ornament of the late 20th Century, a knee-high, upturned satellite dish, also wrapped in paper. Other pieces, like Entkettet (2015), Orthopädische Zustände (2015), Time Span (2015) and Rhizome (2015) are made from Japanese paper, covered in gauze bandage. 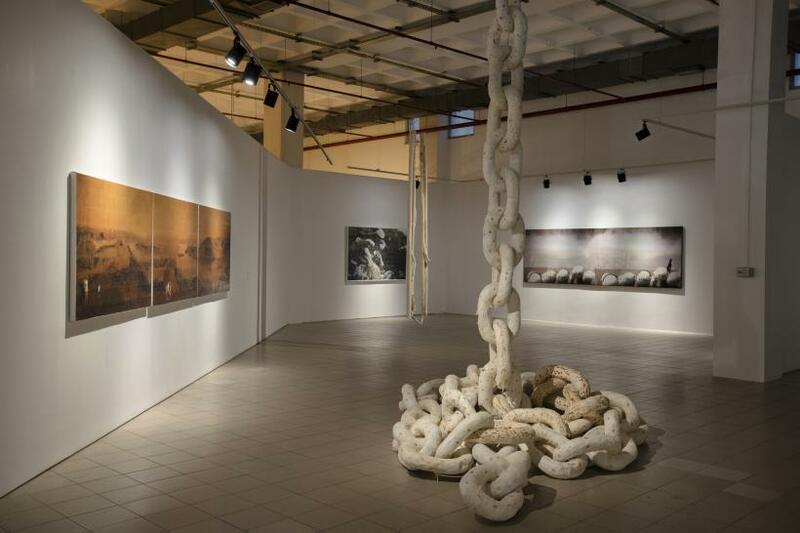 Entkettet is a full-size anchor chain suspended from the ceiling. It’s freckled with rust-like blotches that resemble bloodstains. Once again the object has lost its function. Brittle and bleeding as it is, it cannot hold things together, apart from itself. It’s in the process of becoming sculptural form only. Nevertheless, it would be too simple to read Köker projects as only dark and pessimistic. There is a concentrated engagement with form and transformation and thus with life, in Köker’s work. Bandages are also used to heal, to remedy. As such, there is always hope scripted in these works. For instance, Orthopädische Zustände consists of three suspended objects that look like tree branches. A closer look reveals an elongated tube-like object nestled like a seed in a pod. It is unclear if it wants to burst out of its seams, held together by bandage clips, or is desperately trying to stay in. Is this an open wound, a healing scar or a birth that we are witnessing? Perhaps it is all of these simultaneously? The sculpture, in this transient and hybrid state wherein it is and it is not, functions as form but the status of this form is undecided. With the work Rhizom things are a little more clear-cut. A life-size tree trunk is hung from the ceiling, its mesh of roots dangling down. 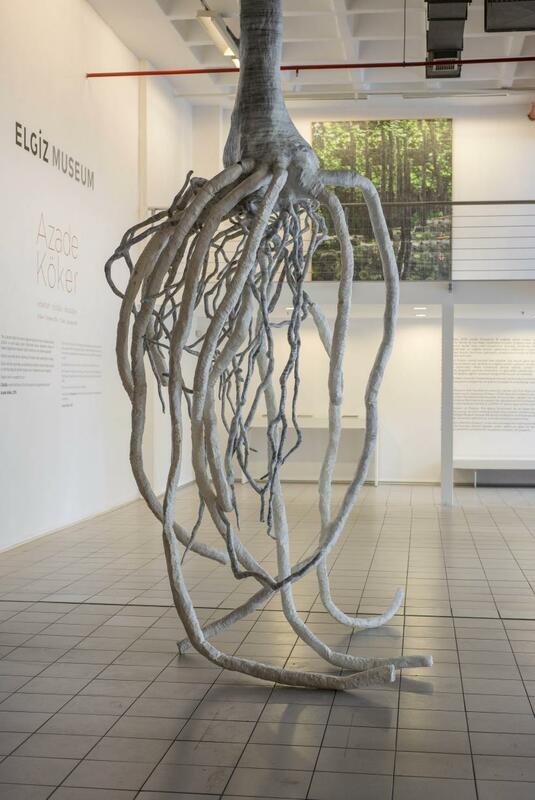 Here Köker reveals what is usually unseen: the tree’s roots. In the sculpture, as in nature, they are proportionally larger than the trunk itself, and often occupy many more times the surface area occupied by the tree’s crown. This tree, however, is crownless. A big gaping cavity stares back at us from where the crown should have been. Like the apartment blocks in Abandoned City, the tree is an empty shell. Dead matter that is hollow. Perhaps both these projects are reminders that what keeps us grounded in life is often invisible, and cannot necessarily be captured in form. This idea is taken into a different direction in The Window, a work from 2011. A window is a frame between inside and outside. It has no function when it cannot channel between these two realms. Köker’s sculptural piece has, as is the case with many of her objects that are moulded from practical items, lost its utility. Like the anchor chain in Entkettet this loss serves to only further highlight the object’s referent in the real world. In other words, we might – for the first time – see the window’s design, the chain’s ingenuity, and the tree’s shape. In a semiotic shift, the signifier has turned into the signified. The idea of a window, tree, and cable becomes completely self-referential. Köker’s window, covered with lace and a specially created cement mixture, does not facilitate any peering in or out. Though its shutters are open, the view is blocked. This window has ceased mediating information, but only mediates itself. This merger of object and mediation is further highlighted by the uniformity of colour and material. In fact, this window is an apt metaphor for much of Köker’s practice. Her work frustrates the act of seeing and refocuses our gaze. 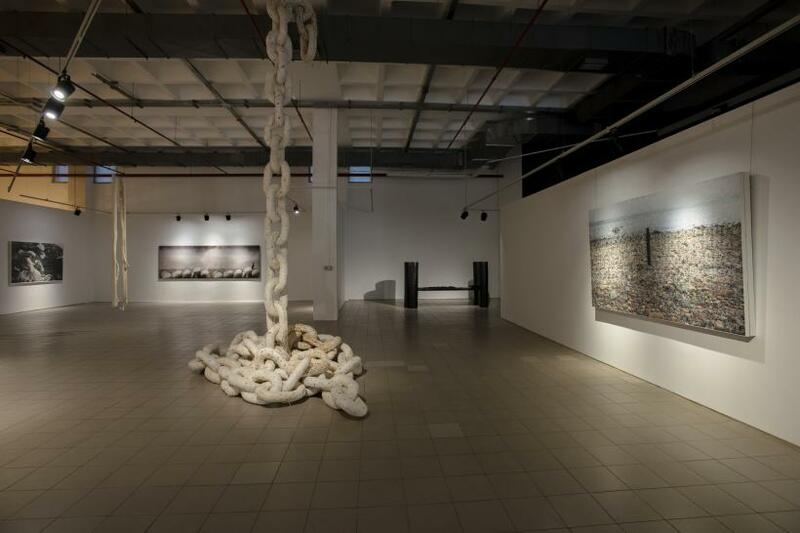 Her photographic mixed media works are in particular testimony to this. 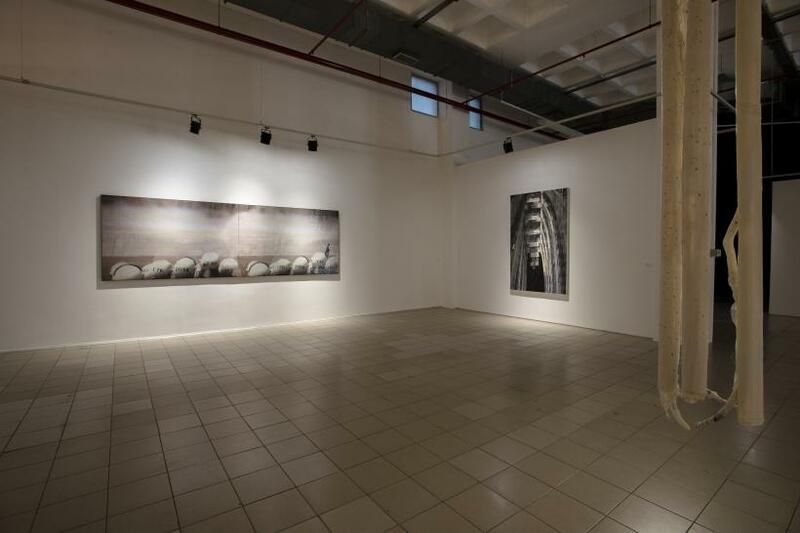 Take for example the five meters long triptych The Walk (2011). Against a blurry terracotta backdrop, which is actually taken from an old Chinese drawing, we can see small groups of people at various distances populating the landscape. These ‘tourists’ as Köker likes to refer to them seem to be looking more at the viewer than exploring their own surroundings. Our conditioned way of seeing is undone, as we are stared right back at. What disturbs the optics even more is the repetitive pattern of human figure cut-outs that are super-imposed on the background image. This gives the photo panorama its relief and movement, but also diffracts it. The question arises then who can be defined as a tourist: the people represented in the work, or us ogling them? Perhaps the experiencing of an artwork always has something of the ‘touristic’ in it: a sense of wondrous estrangement when charting unfamiliar territory. Köker, however, does not allow the viewer to revel too long in this enchantment. Her work always makes us feel just a tad uncomfortable, a little bit on edge. Like her uncanny cityscapes, there is nothing idyllic or picture perfect here. The obsessive pattern of repetition of the cut-outs (human figures, fighter jets, skulls, spiders) is too disorienting to only be aesthetically pleasing and ornamental. This confusion serves the social and political subjects she broaches in her oeuvre well. Köker has no qualms about setting the scene for the issues that concern her: gender and sexuality in her earlier paper collages, Turkey’s flawed justice system in Justice Palace 2 (2014), conflict and war in Tanks in the Forest (2011), waste in Bodrum Rubbish 2 (2013), or the aftermath of natural disaster in the video and mixed media installation Fugue (2013). Important though, is the fact that as much as the material (photography, paper, glue, canvas) mediates her content, it simultaneously also is her content. Azade Köker, a prolific artist working in many different media, is eventually a sculptor at heart. Materiality in her pieces is never pushed aside, but rather than being led by the material properties of its medium as is traditionally the case with sculpture, Köker ever so subtly, with a hint of reluctance but knowingly, allows the material to flit in and out of prominence.